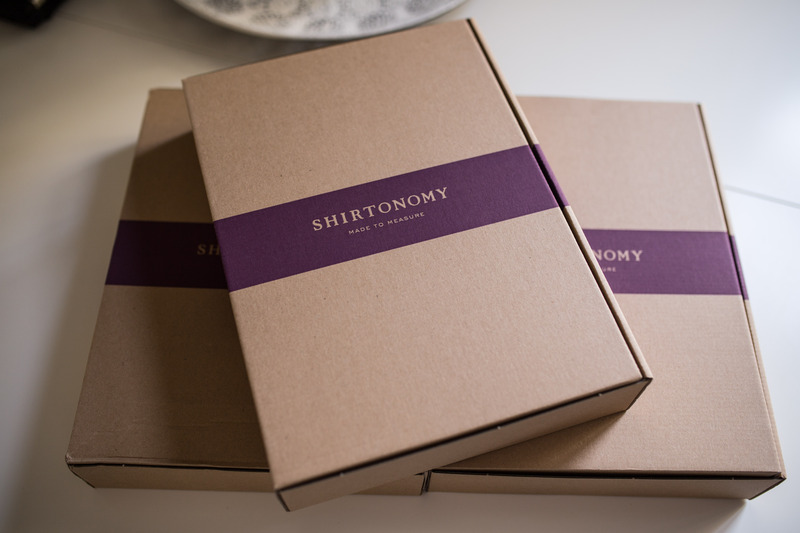 Some weeks ago I wrote about my visit and first order of shirts from Shirtonomy; a Sweden based company with focus on online retail of made to measure shirts. If you’ve missed the first part you can find a link to the article here: Shirtonomy – Made to Measure Shirts Part I. I received my shirts some time back, and I’ve now had some time to wear them. Therefor I thought I would be a good time to share my thoughts and review he results of my MTM shirts and order. Disclaimer: The shirts reviewed in this post were recieved fromShirtonomy for review purpose. As i mentioned in my previous article I ordered 3 different shirts. Below you can see the results and specifications of my order. The first shirts i a classic business shirt in a durable oxford fabric. I chose Shirtonomy’s formal Button Down collar with a single button rounded cuff and “split yoke” in the back are some examples. The shirt is without placket and with Nemo – mother of pearl buttons. For the second shirt I was aiming for a more casual shirt, that can be worn in other occasions besides work. I ended up choosing the raw denim as I’ve seen some pictures of this fabric in social media and really like the way the color fades naturally giving the shirt it’s own character. With some help from Tobias I ended up choosing a Tudor collar and also here with a “split yoke”. The popover also features single button rounded cuffs, popover placket and Gizo – mother of pearl buttons. The fit of the popover is slightly more generous around the chest area to make it easier to put on as the fabric does not stretch as popovers in other fabrics normally do. The third shirt is a classic Tuxedo shirt for the most formal occasions. I choose Shirtonomy’s standard make up of this shirt which features a Marcella fabric, full spread collar, a straight French (dubbel pleated) cuff, and Nemo – mother of pearl buttons. The shirt is completed with 2 removable tuxedo buttons at the top for an accomplished look. As I’ve mentioned this was my first order from Shirtonomy. The normal way of ordering is to measure yourself and order online. I had the privilege to visit Stockholm and Shirtonomy’s showroom and got my measurements taken by Tobias. This turned out very good and I’m really satisfied with the fit of my shirts. After 2-3 washes the shirts no fit perfectly and much better than any of my other RTW shirts in my wardrobe. I must admit I still haven’t had the opportunity to wear the Tuxedo shirt, but both the business shirt and popover fit and feel great. I’m already looking forward to see the new fabrics that will be available soon I think to see what I can order next. the formal button down collar is just amazing. WANT TO TRY A NEW SHIRT FROM SHIRTONOMY?